In July 1648, during the final clashes of the Thirty Years’ War, the Swedish army looted the city of Prague. Among the treasures they stole and brought with them when they returned home was a book called Codex Gigas. Not only is Codex Gigas famous for being the largest medieval book in the world, but because of its contents, it is also known as The Devil’s Bible. 1) The Devil’s Bible is 36 inches tall, 20 inches wide, and 8.7 inches thick. 2) The Devil’s Bible contains 310 pages made from vellum from 160 donkeys. Originally, The Devil’s Bible contained 320 pages, but at some point in time the last ten pages were cut out and removed from the book. 3) The Devil’s Bible weighs 165 lbs. 4) The Devil’s Bible was meant to be a work of history. That’s why it contains the Christian Bible in its entirety, The Jewish War and Jewish Antiquities by Flavius Josephus (37–100 C.E. ), an encyclopedia by St. Isidor of Seville (560–636), and The Chronicle of Bohemia written by a Bohemian monk named Cosmas (1045–1125). In addition to these texts, there are a number of shorter texts included as well, e.g. on medical practices, penitence, and exorcism. 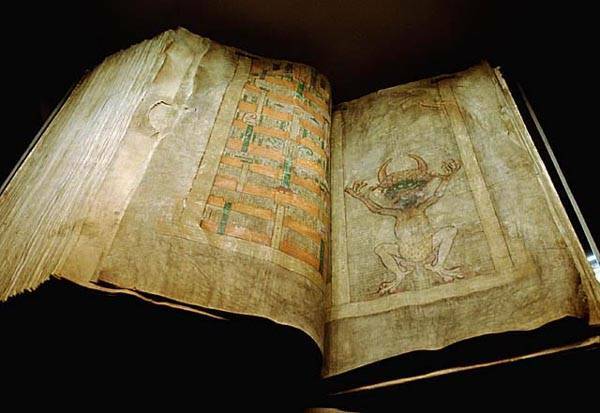 National Library of Sweden, Codex Gigas, or The Devil’s Bible, Book of Genesis, 2 r.
5) The identity of the scribe who created The Devil’s Bible is unknown. Scholars believe that the book is the creation of one person, most likely a monk living in Bohemia (today a part of the Czech Republic) during the first half of the thirteenth century. 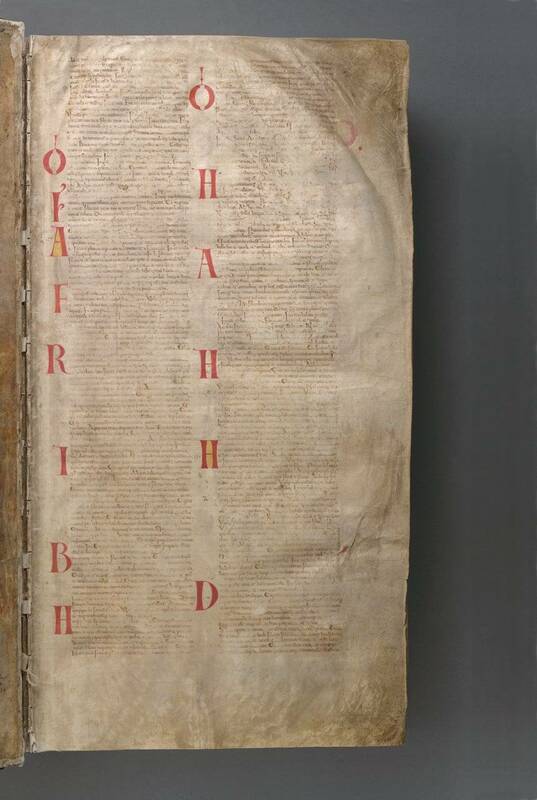 National Library of Sweden, Codex Gigas, or The Devil’s Bible, Gospel of Matthew, 254 r.
6) Based on the amount of text and the details of the illuminations, it has been estimated that it took as long as thirty years to finish the book. In other words, the anonymous scribe seems to have dedicated the most part of his life to creating The Devil’s Bible. 7) In 1594, The Devil’s Bible was brought to Prague from the Broumov monastery, where it had been kept since the year 1420. King Rudolph II (1576–1612) asked to borrow The Devil’s Bible. He promised the monks that when he was finished with the book, he would return it. Which he of course never did. 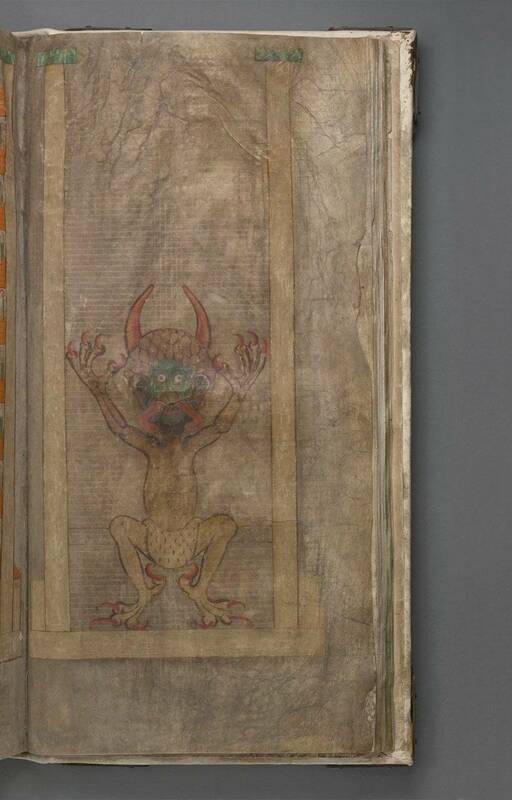 National Library of Sweden, Codex Gigas, or The Devil’s Bible, The Devil, 290 r.
8) The Devil’s Bible has been given its name because of a full-size portrait of the Devil. Portraits of the Devil were common during the Middle Ages but this particular portrait is unique. Here, the Devil is portrayed alone on the page. The image is very big—nineteen inches tall. The Devil is crouching and facing forward. He is naked apart from an ermine loincloth. Ermine is worn as a sign of royalty. It is believed that the Devil wears ermine in this image to demonstrate that he is the Prince of Darkness. 9) There are several myths surrounding the creation of The Devil’s Bible, and they all involve the Devil. One of the most famous myths is that the scribe traded his soul to the Prince of Darkness so that he could complete the book in one night. 10) On the opposite page of the portrait of the Devil is an image of the Heavenly City. This has been interpreted as the Heavenly Jerusalem mentioned in the Book of Revelation. It was common in the Middle Ages to leave book spreads on display to convey a message to those who saw it. 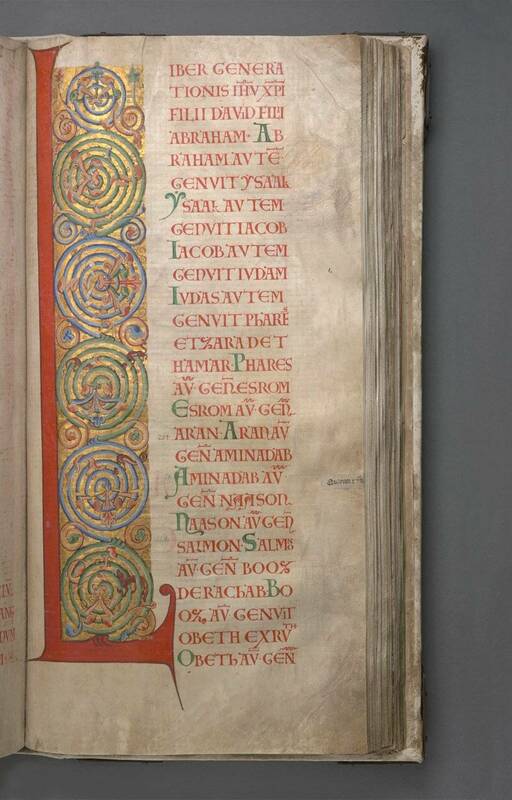 It is believed that the message intended here is to show the rewards of a God-fearing life on one page and the horrors of a sinful life on the other. Codex Gigas, or The Devil’s Bible. The Heavenly City (289 v.) and the Devil (290 r). If you’d like to read more about The Devil’s Bible, please visit the book’s official home page at the National Library in Stockholm, Sweden.